World Wide Web stories at Techdirt. stories filed under: "world wide web"
We've pointed out before how grateful we are that Tim Berners-Lee didn't look to patent the World Wide Web in the early days, because it's unlikely it would have developed as it did if he had. 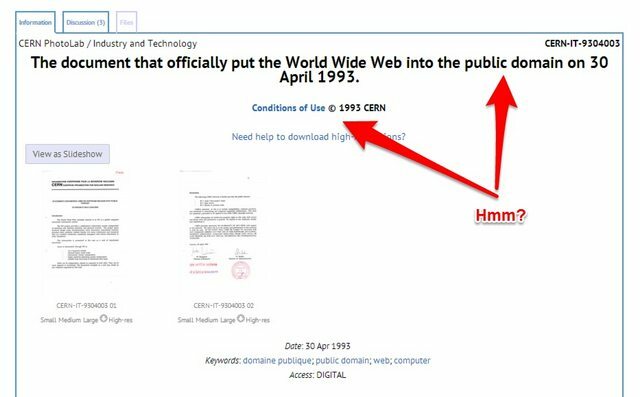 Over at CERN, where Berners-Lee worked at the time, they have an archive in which they show "the document that officially put the World Wide Web into the public domain on 30 April 1993." Indeed, it is a great thing that CERN quickly and clearly put the main concepts behind the web into the public domain. But, as David Sleight points out it does seem rather ridiculously ironic, that in order to view the documents that "put the web into the public domain," you have to agree to a copyright notice from CERN: Technically, CERN is probably correct. While it put the concepts that underlie the web into the public domain, the specific images and documents are still covered by copyright. Furthermore, it's quite likely that the "conditions of use ©" notice are just standard artifacts on basically every CERN document or image. However, it still highlights how we live in a world today where people are constantly in a default mode of "protect" everything and "lock up" everything, even in cases where it makes absolutely no sense. Does this document need copyright? Obviously not. Is there any purpose at all in having it under copyright? Not at all. And yet, it is. And that's a sad statement on the nature of copyright today. The project has two phases: firstly we make use of existing software and hardware as well as implementing simple browsers for the user's workstations, based on an analysis of the requirements for information access needs by experiments. Secondly, we extend the application area by also allowing the users to add new material. The manpower required is 4 software engineers and a programmer, (one of which could be a Fellow). Each person works on a specific part (eg. specific platform support). Each person will require a state-of-the-art workstation , but there must be one of each of the supported types. These will cost from 10 to 20k each, totalling 50k. In addition, we would like to use commercially available software as much as possible, and foresee an expense of 30k during development for one-user licences, visits to existing installations and consultancy. Quite amazing what that one, quite small, project has since become.